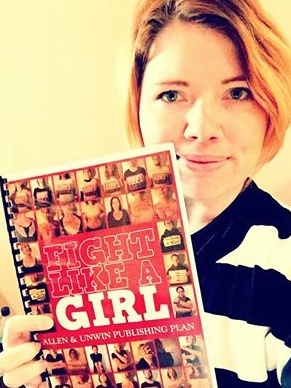 Clementine has just signed a publishing agreement with Allen & Unwin for her anticipated journalistic memoir Fight Like a Girl: raise voices. raise courage. raise the flag. “This afternoon, my fantastic agent and I accepted an offer from Allen & Unwin to publish my debut non-fiction book in 2016. Part memoir and part polemic, ‘Fight Like A Girl’ will look at a cross range of issues that make up the battleground of being a woman in a still very much sexist world. It aims to enrage and inspire in equal measure, and ultimately light a fire of recognition in the hearts of all girls and women who feel angry without release and suffocated by the expectation that they be quiet about it if they don’t want to ‘put people off’. ?” – Clementine Ford Facebook. “I could not be more excited about the prospect of working with you on this important and hugely anticipated book. You’ve been an inspiration to me and so many others and I would be honoured to assist in making Fight Like a Girl the best book it can be.’ – Jane Palfreyman.